In this mini series of running Sitecore in docker containers, it is now time to have a look at a container for running Sitecore publishing Service. This container will setting up the service following the manual process found in the installation guide at dev.sitecore.net. The recommendation specifies that service should be hosted on an IIS so as an base image I will be using the Microsoft/IIS from docker hub. Over the base image there will be installed dotnetcore hosting using https://chocolatey.org/. Be aware that this docker image will be using windows containers, and you can’t combine linux and windows continer in docker yet. SO ! To help configurering the container a couple of support files is created. First a small powershell script for manipaluting the connectionstrings into the templates file ”sc.global.xml” which is then copied into to the configuration. And yes I know the powershell could be written more crisp sorry..
(Get-IISAppPool "DefaultAppPool" ).ManagedRuntimeVersion = ""
Once build you should be able to run it. DID YOU REMEMBER TO SWITCH TO WINDOWS CONTAINERS ? You can’t use localhost because of some windows natting with docker issues sorrym this is comming in the near future. Once the container is up and running inspect the container to get the ip. And that’s all. Now you are using the new publishing service with IIS hosted in docker. Congrats. So test it by publish your entire site i Sitecore 🙂 and be amazed be the publishing service speed. Once i get around to it i will publish the image to docker hub. In this blog post i only gave one way to run the publishing service there are of course others. And also the image can be optimised. 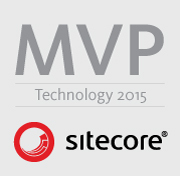 Sitecore MVC the first controller. Sitecore 6.6 is now out, (as a technical preview), with the realse of this version Sitecore now offers full support for MVC. 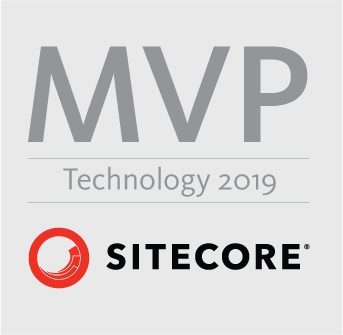 There have all ready been quite a few blog post how to user MVC with Sitecore and some of the new fetures offers a great deal of ease when developing with Sitecore. So this is the first in a series of how to develop with Sitecore using MVC and some of the benefits you get for free using MVC. 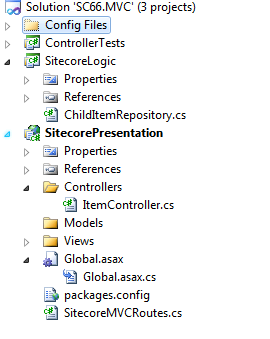 If you haven’t allready read John West blog post on how to setup you Sitecore solution to use MVC you can read them here start with Part 1 and use part 3 to setup a visual studio solution .John also wrote some simple examples on how to use the MVC framework to return JSON serialized result from a controller you read his original post here. For a first post in this Sitecore MVC series we will revisit his example and create our own controller but with a different approach, and with the soon to be released .Net 4.5 Framework which include the new web-api this should be even easier, and given you even more flexibility for free and out of the box, we will look back at this example when the final release is out. By now you should now have an up an running Sitecore 6.6 solution. 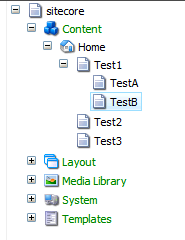 My visual studio solution setup is shown below. Now lets create our first controller Code listed below. With the controller in place you can change the route to newly created controller John in his example uses a Pipeline in Sitecore to achieve this i like this approache so much more the using the global.asax so we reuse his code for this with some minor alternations. The Id of the node we want to retrieve children for if not specified default to the id of the Home-node. I’ve done this because i don’t like all his assert for empty id, and if you don’t like you can just use the original approach with optional url parameter.You could if liked alsp default the index action. But instead of getting the id trough the url route data you should supply it as a argument to the action method. The key here is that parameter Id must be named the same as the input parameter in index method. Now we will implement the busyness layer that will supply the controller with data. This is done through a ChildRepository the code is listed below. Now with a valid id different form the home-node. And now with a invalid id. There we go the code does the same as Johns but with out all the assert tests.